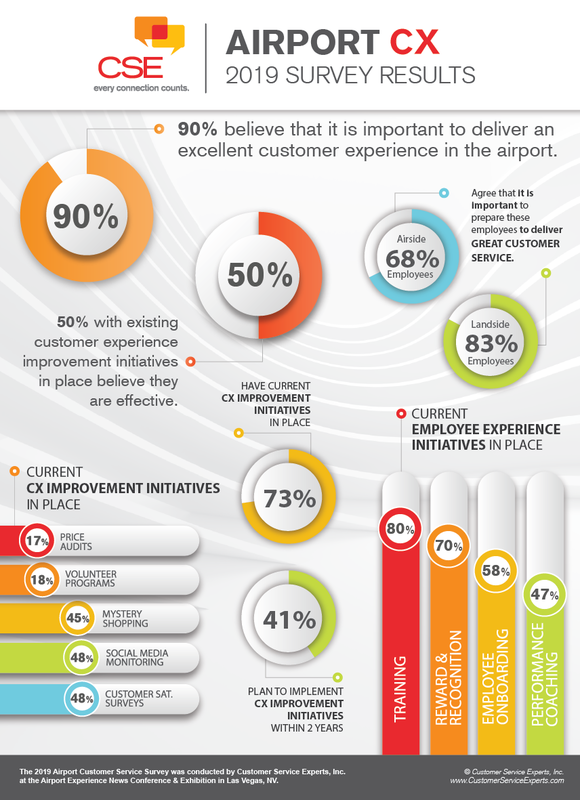 We were thrilled the data confirmed that 90% of respondents believe what we have been shouting from the rooftops for more than two decades: It is important to deliver excellent customer service in their airport or organization. That’s the good news (we will keep working on the 10% holdouts), but there are still plenty of opportunities. While 73% of those polled indicated that they have CX improvement initiatives in place, only 22% feel that these programs are effective. Additionally, even with the uptick in the presence of customer experience programs within airports—2019 results saw a 15% increase over 2018—over 50% of those programs are not seeing results. What could be causing this disconnect? Often times, organizations approach CX with an á la carte mentality, adding a few initiative components here and there. Let’s face it, each airport has its own, specific set of needs when it comes to empowering employees with sustainable customer experience practices, and sometimes the balance isn’t always quite right. For example, a standalone mystery shopping program, though beneficial in benchmarking, will not teach employees how to modify their behavior to elevate their mystery shop scores. A training program will demonstrate how to provide excellent customer experiences, but without rewards and recognition, employees often lack motivation to perpetuate and sustain these learned behaviors. Bottom line: A truly successful Customer Experience culture is purpose-driven and combines metrics (from mystery shopping & customer satisfaction surveys), education (via CX training), and appreciation (through rewards & recognition). This is what creates the foundation for excellent customer experiences. Is your organization utilizing this multi-pronged strategy? Are you seizing every opportunity to boost results? If not, you may want to re-examine your efforts. At CSE, we have been applying this multidimensional approach for 26 years, and the results have proven to positively impact service cultures, improve employee engagement and performance, and increase profitability. Click Here for the downloadable .pdf version of the 2019 infographic.